I know that I told you all I'd be trialing an Anastasia brow product a long time ago. Well due to issues in getting samples out to bloggers I ended up getting my parcel quite a few months later than expected but with the fantastic bonus of another product to try. I have been dying to try this because when I heard about it, it seemed far too good to be true. 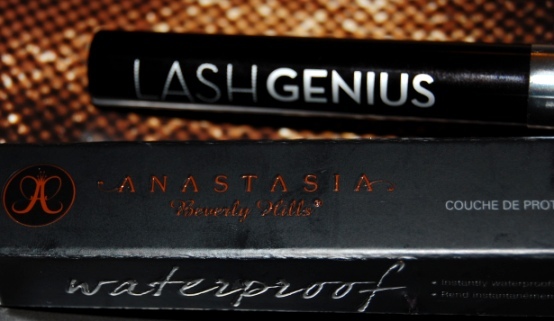 Anastasia Soare's beauty range Anastasia of Beverly Hills has made bold claims with their new Lash Genius. This product primarily works to waterproof your favourite existing mascara. It is a topcoat that according to their website "instantly waterproofs, refreshes, and protects any mascara all day." I must say that I was a little skeptical but excited by this idea. With the summer coming, I couldn't wait to take this product and put it through its paces. On its own Lash Genius simply looks like a mascara in some rather nice packaging, but don't let that deceive you. Apart from a slightly chemical smell in the tube (didn't notice it at all though from the wand), the product is clear gel-like and didn't irritate my eyes upon application. The brush has quite stiff comb-like bristles and while I was worried it might not cover all my lashes, it actually managed to get through my slightly stiff and already clumped lashes without much trouble. The stiff bristles actually helped it get to the roots really well. I strongly approve of any brush that lets me get to the roots of my lashes properly so this is a tick in my book. So here is my everyday eye makeup. I had trouble finding a decent shot of this as by this stage in my photos I might have already applied the product. Can you tell? No? Me neither. What I'm wearing as my usual daily mascara is actually a combination of 2true's Voluptulash and Accessorize's lengthening mascara ... because I like to be awkward. Now I personally know that this combination isn't at all waterproof so I was really interested to see what would happen next. Now the eye with two heavy coats of Anastasia's Lash Genius applied here is on the left. One application of the product actually helped define my already applied mascara and only after two very heavy coats did I notice the lashes looking at all like they had been moved. Lash Genius did very little to disturb the product that was already there and I don't feel I lost the desired effect of my chosen mascaras. All I notice is my lashes are slightly more bouyant? Between each application I left a few minutes for this to dry as I would a mascara - just to give it a fighting chance. This second shot is literally taken about a minute before I threw a lot of water at my face. In the picture below however, it's fairly obvious which eye has the Lash Genius on! There is no visible product migration from the left eye and yet on the right hand side I'm sporting the panda look. There are actually droplets of water on my lashes and yet the black pigment on the left hasn't moved. I even screwed my eyes up for good measure before I took this in order to fully simulate what having a good cry looks like. The staying power is quite incredible and although my lashes themselves moved a bit after a soaking, the product did. not. budge. Having left my eyelashes to dry out naturally after this, the eye with a topcoat on looks simply a little clumpier than before and not panda-esque at all. Even having given it a good rub just now nothing came away. I haven't had any real irritation at this stage although by now I'm quite aware that the makeup is still there. However normally I would at least blot my eyes! My current mascaras when combined don't normally fare as well and there was no flaking, smudging or smudging of any kind. Removal with a makeup wipe was actually slightly better than what I normally experience with my daily mascara. If you plan on visiting a pool, beach, the movies (Monsters Inc. gets me every time) or any other venue where you might not be able to guarantee a dry eye this Summer; I'm fairly sure that this product could literally save your face! As a precautionary measure, it works perfectly. I know that my Mum has very sensitive eyes and real trouble with mascara migrating, so I'm fairly certain this would probably solve her problems too. As for me, I know exactly when I'd wear this. There happens to be a hot-tub in my boyfriend's back garden so this will be in my makeup bag for the rest of the Summer! The Anastasia Lash genius costs $21 and can be purchased here and their shipping is worldwide! Other Anastasia of Beverly Hills products are also available at Sephora. I also have my Anastasia brow review coming up soon! This is such a stunning eye look. I love how you used the blue under the eye so it does not look overdone. Your eye color is quite exquisite. Thank you! I mostly use my tribute mono eye shadow by Rimmel, a paler highlight shade and a green No. 7 eyeliner pencil. And my eye colour is due to the fact my Mum has green eyes and my Dad blue. I somehow got both!